Home Invasion! Keep House Centipedes Out of Your Home! An unpleasantly common sight over the summer is those dreaded house centipedes that crawl along the walls of your home or hide in the corners of the basement. These creepy critters are quick and can scare just about anyone. But how harmful are they really, and more importantly, how do you keep them out of your house? Other than looking creepy and prehistoric, the house centipede is not harmful to humans. In fact, it can help get rid of other bugs that may be lingering around your home such as flies and moths. Regardless, it’s not enjoyable to find these creepy crawlers scurrying across your walls or hanging around in your bedroom and we would probably all be much happier if they stayed outside. Decrease moisture in your home: Centipedes thrive in cool, damp environments and therefore like to hang around in any dark areas of your home such as the bathroom or basement. Using a dehumidifier to decrease any moisture your home might have will force these pests to find a new place to live. Get rid of any other bugs in your home: Centipedes feed on other insects so if your home doesn’t have any other bugs around, then the centipedes will have to look elsewhere for food. A good way to keep these pests is to make sure that any possible entry ways are blocked off so they can’t get into your home in the first place. Seal any cracks or crevices around your home, and also make sure the perimeter of your house is cleared of any leaves to prevent damp conditions. Another good prevention method is to spray a barrier, such as our Home Perimeter Pest Spray, around your home to keep bugs out. 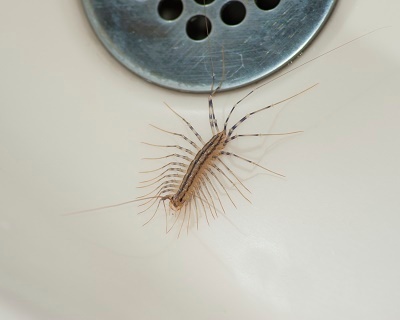 Want to learn more about house centipedes and how to keep them out? Check out this article. Finding any type of bug in your home isn’t ideal and everyone would be much happier if those pests stayed outside. A professional lawn care company can help keep any unwanted bugs out of your home. Find out what you need to know before you hire a professional with our Hiring Guide! It will give you helpful tips and advice on what you should consider before hiring a professional company. Download our FREE Guide now!